When making HSTs, I normally use a quick method for trimming them to size that involves trimming them with a special ruler called the Quilt in a Day Square Up ruler. Before I bought one, I used a regular ruler marked with a dry erase marker to quickly trim HSTs before pressing. But even if you've already pressed your HSTs open, you can still trim them down to the right size--you just have to use what I call the old-fashioned way. If the HSTs in your block are 2" finished, then you'll need to trim the HSTs to 2-1/2". 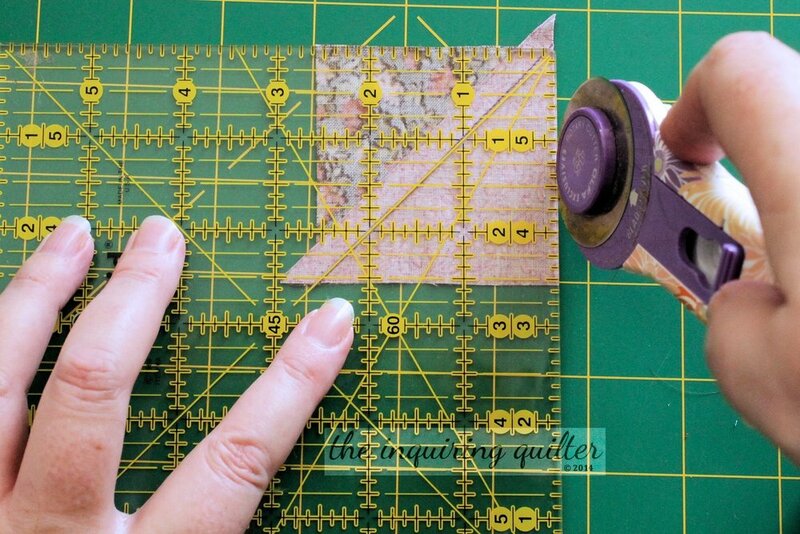 Place the 45-degree mark on your ruler on the diagonal seam, and trim the right side, then the top side. (If you’re left-handed, trim the left side, then the top.) Notice that I’m not trimming the HST to exactly 2.5” just yet; I’m leaving a bit of wiggle room for squaring it up when I trim the other two sides. Be very careful when trimming the top so that you don’t wiggle the ruler or slip the rotary cutter. A turntable cutting mat is handy for this kind of trimming, although I find that mine wiggles a bit when I press down to cut. If you’re new to this rotary cutter business, you might find it helpful to wear a rotary cutting glove on your non-rotary cutting hand to protect it. Even though I’m no longer new to rotary cutting, I sometimes use my glove whenever I’m cutting across or towards myself, just to be safe. Place the 45-degree line on the seam of your HST again, and trim the remaining two sides. Now’s the time to trim the HST to exactly 2.5”. That's it! Your HSTs are ready to piece into your block.